Holidays should be a time to create memories with loved ones. You should not worry about planning a holiday party, how much food to prepare, taking coats, and cleaning up. You should be able to relax, laugh with family and friends, and enjoy food that brings back childhood memories without exceeding your budget. 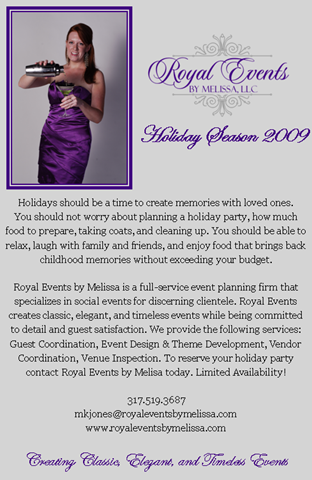 Royal Events by Melissa is a full-service event planning firm that specializes in social events for discerning clientele. We create classic, elegant, and timeless events while being committed to detail and guest satisfaction. Royal Events provides the following services: Guest Coordination, Event Design & Theme Development, Vendor Coordination, and Venue Inspection. Whether you are needing assistance with preparing a small sit-down dinner, holiday open house, or a formal event, please remember Royal Events by Melissa. We look forward to having the opportunity to serve you. For more information or to reserve your holiday party contact Royal Events by Melissa, by clicking HERE. Limited Availability!